Free Plan Do Study Act PowerPoint Template is a PowerPoint template inspired by the PDSA cycle or PDSA model. 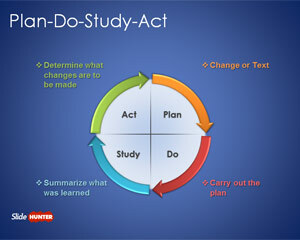 PDSA stands for Plan-Do-Study-Act. You can download this free PDSA template for PowerPoint with a simple PDSA cycle diagram in the slide design that you can copy to your PowerPoint presentations.